Recently the debate over how altruistic traits evolve has intensified. Part of this debate centers on whether alternative theories (e.g. inclusive fitness, multilevel selection, and reciprocal altruism) represent different perspectives on the same underlying phenomena, and can therefore be unified, or whether each different theory represents a unique empirical mechanism. Towards unification, I present a simple and general framework that highlights an underlying necessary condition for the evolution of altruism: assortment of carriers of the altruistic trait with the helping behaviors of others. I also critically examine the claim that inclusive fitness theory uniquely explains the evolution of altruism. While many see the controversy around this claim as merely semantic arising out of different definitions for common terms (e.g. altruism and cooperation)I argue that it also represents different views about the proper hierarchical level at which to assign causation. Presentation delivered to the Evolutionary Games Workshop, held at Banff International Research Station (BIRS), June, 2010. 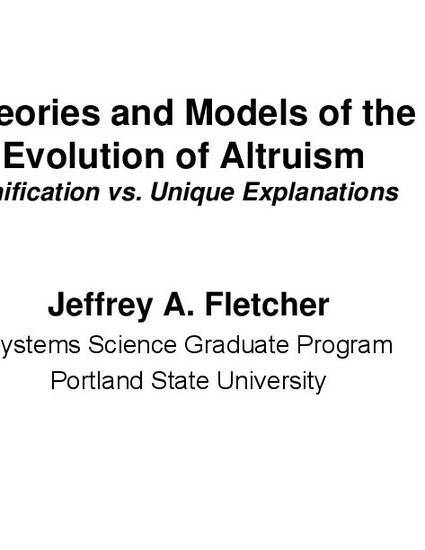 Fletcher, Jeffrey A., "Theories and Models of the Evolution of Altruism Unification vs. Unique Explanations," Evolutionary Games Workshop, June, 2010.